L&Q’s Energy team has won the Residential Energy Project of the Year award at this year’s Energy Awards, which took place at the London Hilton on Park Lane. 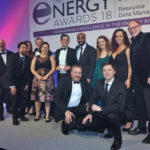 The event brought together over 600 of the most senior operators in the energy market (both local and international) to recognise and celebrate the very best in the energy industry. L&Q’s team was commended for taking a comprehensive approach to energy savings through work on the EnergySave project with ZapCarbon. The scheme helps residents find ways to cut their energy bills. Residents receive a visit from an L&Q Energy expert who conducts a full home energy assessment and gives advice on the most efficient use of heating, hot water and appliances. Residents also receive free energy saving devices, including an energy monitor, and are encouraged to take part in an ongoing support programme. More than 23,000 successful EnergySave visits have been made since the start of the programme. In September, L&Q’s Energy team also took home the title of National Landlord of the Year at the National Energy Efficiency Awards. L&Q was recognised for the size and scope of its energy efficiency work, the impact on the local community and level of expertise.